When I was in Morocco last December, my family and I went on a quad bike ride around Lake Lalla Takerkoust which is approx. 45 minutes away from Marrakech. It’s a manmade lake but don’t let that term discourage you from going there because the views surrounding the lake were still breathtaking and my family had an incredible time. Of course, everyone was taught how to handle the bike but anxious little me started thinking of the worst case scenarios. What if my hands get tired (they did btw) and I accidentally let go? What if something appears out of nowhere, scares me and I lose control of the bike? What if I get hit by a truck when I’m on the road? All these crazy (but possible) scenarios were buzzing in my mind but to the cut the story short: when you’re tossed in the deep end, you learn how to swim to keep yourself afloat. When you’re not given much choice: you’ll learn to do the job somehow. I was already on the quad bike, everything was paid and my ego wound’t let me look stupid in front of everyone. That day in Dahab turned out to be one of my happiest memories in Egypt. 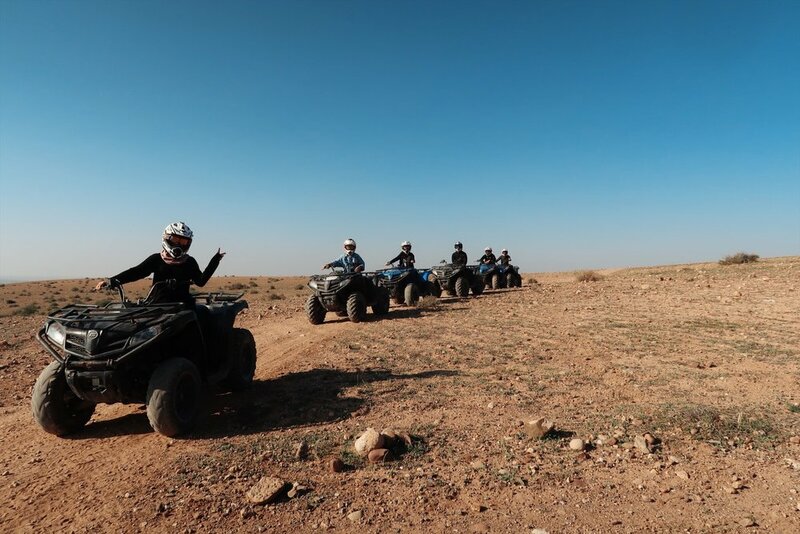 When I got the chance to bring my family to Marrakech, I just had to include quad biking in our itinerary. We spent at least 2 hours on the bikes going up and down hills, avoiding rocks and shrubs, slowing down whenever a truck was passing by. At one point, we had to stop our ride because a shepherd and his flock of sheep were in our way. If it weren’t for the shepherd and his sheep, we wouldn’t be able to stop and enjoy the views of our surroundings—we would have had our eyes fixated on the path in front of us for another half an hour straight. That incident made me realise: What is the point of living if all we do is rush from one place to another without stopping to appreciate how far we have come? The biggest lesson I took home that day was how much we underestimate our ability to adapt to different landscapes—I mean that both literally and figuratively. We always fear the challenges that come our way not realising that if Allāh puts an obstacle on our paths, it’s because He knows we are capable of solving the problem and if we aren’t, it’s just a grand opportunity to turn to Him for help. Our ride to the lake was therapeutic even though it wasn’t a smooth ride all the way (read: lots of rocks). In spite of the bumpy ride, it was great fun. When there was a rock or a shrub in front of us, we avoided it. When we were on rocky grounds, we just had to grip the handles tighter. When we could see a truck going near us, we gave way. As we went uphill, we pressed our throttles harder. When we were going downhill, we slowed down or pressed our breaks if needed. When our guide waved his hand, we knew we had to slow down. We responded to every obstacle and sign accordingly. This journey we call life is no different: it’s all about responding to each situation appropriately. When we are stumped with any sort of hardship, however big or small, it’s important to ask ourselves: what is this situation trying to tell me? What do I’ve to improve on to overcome this? There are always signs telling us what we need to do. When I’ve my anxiety attacks, it’s really my body telling me: I’m overexerting myself by trying to control things far beyond my capabilities. When I’m stressed out over a busy week, what my stress levels are trying to tell me is: I’m not managing my time and expectations effectively. If I’m sad: I know something has challenged my perception on how a happy life should be therefore I need to reassess the situation carefully to see if my feelings are appropriate or just an overreaction. There’s a solution within all your problems—you just need to pay attention to the signs. Pay attention to how your body and soul are feeling. Sometimes the sign is how our bodies feel: Are you sick all the time? Do you struggle to fall asleep? Do you constantly feel sluggish? Sometimes the sign is your inability to focus on anything. How focused are you during solat? You may think it’s unrelated but I’ve found that when my prayer lacks focus, many things in my life do, too. Sometimes the sign is in how your soul never feels at peace. Ask yourself what is missing from your life that your soul is trying to say?